During this time of year, for normal and oily types of skin (without severe blemishes), I kick up exfoliating for my clients (and even myself!). I tend to favor enzyme exfoliation over face scrub, especially if there is active acne present. For acne prone skin, the best choice is enzymatic exfoliation based on fruits like papaya – AcnEase actually has a great acne exfoliation recipe for this, which will chew the dead skin cells and leave the live ones alone. And please make sure to avoid any abrasive methods that may result in inflammation. Feel free to use an enzymatic exfoliation up to three times a week (but again, not if you have open cysts), but always listen to your skin, and if it feels like it’s getting too dry or irritated, pull back. The next step in ensuring a holiday glow is bringing more moisture into the skin. Hydrated skin is a happy skin! To get your skin happy, adjust your cleanser. Gone are the days of summer sweaty, sticky, SPF skin and for some, the days of chapped, dried out and irritated skin are here. Get ahead of this change by switching your gel, or foaming cleanser to a milky or oil cleanser (non-comedogenic of course). These cleansers will clean your skin without stripping it from necessary essential skin oil. If you can’t let go of your foaming cleanser, then try to use it just once a day at night, and use the gentler one in the morning when you truly don't need the extra cleaning. Don't be afraid of oil! Many recent studies show that using the right oil can help control your own body's oil production and help build your own skin’s immune system. Look for oils high in linoleic acid like sunflower and rosehip oil – you can even try the latest craze of coconut oil, which works for some people. Switch your lighter moisturizer to oil, or even add a layer of an oil-based serum under your moisturizer. Oil, helps to trap the water in your skin that would otherwise evaporate into thin air. Using an oil-free moisturizer all year round, especially in colder climates, may promote dehydrated skin. What you need to use is products that contain some healthy oils but are lightweight and non-sticky to help to grab moisture, and not dead skin cells and dirt. Indulge your skin by using a hydrating mask a few times a week. I like to put a mask on after the shower, or in the morning while I am making coffee and getting ready. You can even try this soothing and anti-inflammatory moisturizing oatmeal mask. After using a mask regularly, I noticed the hydration levels in my skin increase dramatically. It’s a simple and easy way to bring more moisture to your skin, especially if you don't want to use a richer cream for fear of getting more breakouts while using heavier moisturizers. Use a brightening eye cream in the morning too. Most people use their eye cream at night, if they even use one at all. Use one! And use one in the morning instead of at night. If you wake up puffy, it could be because of that third glass of wine or because of your eye cream. While you sleep, the lymph fluid can pool under the eye area, especially if an active or super hydrating eye cream is applied. If you wait until the morning, and put it in the fridge, not only will you be less puffy, but the cool eye cream will help to bring down any inflammation. Look for an eye cream with vitamin k, which is the best for fighting dark circles. And don’t forget to take your AcnEase every day to control your acne! 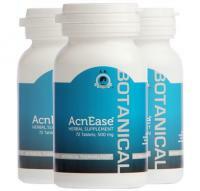 (PS – to those already on it, you can increase the dosage during the holidays for some extra acne-fighting power). Enjoy the holidays and your extra glow!